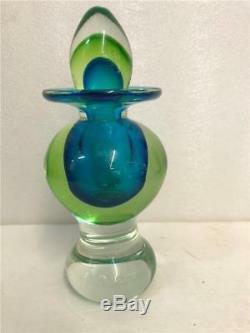 This listing is for a very lovely Mid Century Modern Murano Sommerso. It is unmarked but looks very much like ones found on line. It may have had a paper label that was lost. This is very heavy clean glass and it has a nice fully polished base on the bottom. The overall look of it is very much the colors of the late 1960's. It is 8 " tall to the top of the stopper, and 3 1/4" across at its widest point. This is in perfect flawless condition... No damage of any kind. 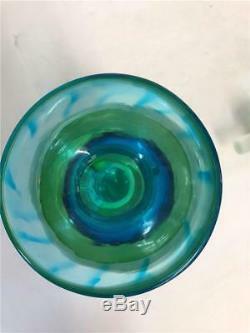 The main glass is clear with interior layers of green and blue and a fully ground and polished base. 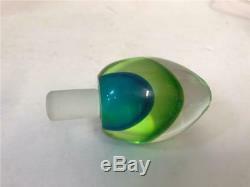 Murano Vintage Mid Century Modern Perfume Bottle Sommersa unsigned Handblown. 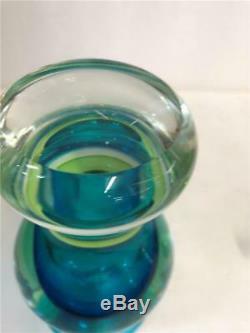 The item "Murano Vintage Mid Century Modern Perfume Bottle Sommersa unsigned Handblown" is in sale since Monday, September 24, 2018. This item is in the category "Pottery & Glass\Glass\Art Glass\Italian". The seller is "ourfinds" and is located in Allen, Michigan.